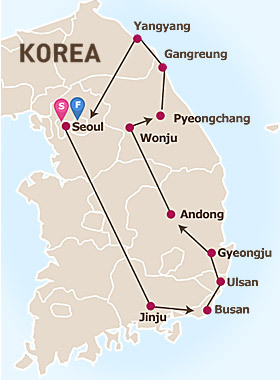 Rich history and marvelous scenery are the highlights of this Seoul & Eastern Korea 7 Days tour. South Korea's eastern cities boast 1000 years of rich history, including Seoul, Gyeongju and Andong, where you can discover numerous UNESCO World Heritage sites. In addition, you can trek the slopes of the most famous mountain in Korea, Mt. Seorak. The old and new co-exist together in Seoul. Join this tour to enjoy the experience! After breakfast, meet up with tour guide at hotel lobby. Visit Gwanghwamun Gate, the main gate founded by the first king of the Joseon Dynasty and enjoy the Royal Guard Changing Ceremony. Next, explore Gyeongbokgung Palace (Changdeokgung Palace on Tuesday), arguably the most beautiful and the grandest of all five palaces. Then pass by Blue house, also called Cheong Wa Dae, the presidential residence and stop by Gingseng shopping center. After lunch, head to Myeongdong, one of the busiest places in Seoul and among Korea"s premier shopping destinations. Then explore Namsangol Hanok Village (Bukchon Hanok Village or Insadong on Monday) where there are five restored traditional Korean houses and a pavilion, a pond and a time capsule. Lastly, we will visit N Seoul Tower, offering panoramic views of Seoul and the surrounding areas. After the tour, you will be transferred to your hotel. After breakfast, meet tour guide at hotel lobby. The first stop is Jinjuseong Fortress, historically linked to the Japanese invasion in 1592.After then, transfer to Busan and head to Dongbaekseom Island near Haeundae Beach. Also, visit Centum City Shopping Mall, Korea"s the most sought-out shopping destination. After dinner, check in hotel and rest of the day is at leisure. After breakfast, transfer from Busan to Ulsan and visit Ulgi Park, littered with rocks carved into interesting shapes by the wind and ocean. Next, explore Bulguksa Temple, the representative relic designated as a World Cultural Asset by UNESCO in Gyeongju. Explore to Gyeongju National Museum, Tumuli Park and Cheomseongdae Observatory. Lunch and dinner will be served en route at local restaurants. After hotel check in, rest of the day is at leisure. US$ 1350 per person- based on 2 sharing a room and airport transfers.